Preparation: Line a 2 quart stainless steel bowl with plastic wrap. Cut round top off the cake to make a flat surface. Save cake scraps. Using a turn-table...cut cake into 4 equal layers. Press 1 layer into the bottom of a lined stainless steel bowl. Place 15 oz. of zucotta filling on cake...place another cake on top and repeat creating a total of 3 layers of filling and 4 cake layers. Note...put the smallest layer of cake in the bottom of bowl and finish with the largest. 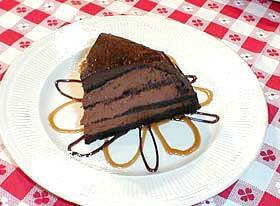 Using a palette knife, frost cake completely and evenly with chocolate frosting. Preparation: Cover chocolate with plastic wrap. Melt and keep hot (a hot box is best). Put all of the cream in a large mixer with the Sambucca. With whip attachment, whip for 2 to 2 1/2 minutes on speed 3...no peaks. When cream is under whipped (cream just begins to stick to sides of bowl) and chocolate is hot to the touch...pour chocolate quickly into the mixer. On speed 3, whip until incorporated. Scrape bottom and sides. Add remaining cream and whip until incorporated on speed 2 for approximately 30 seconds. Then scrape sides and whip on speed 3 for 1 minute. Do not overwhip cream and chocolate.